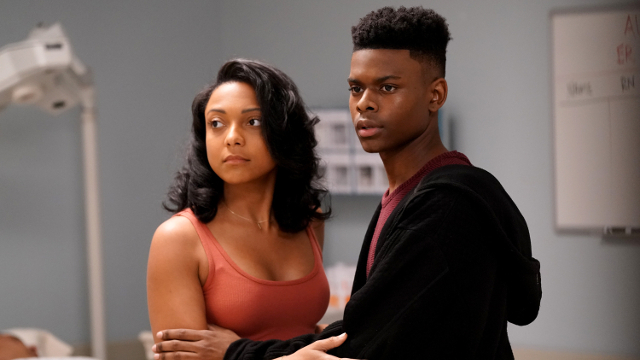 Cloak & Dagger season 2 episode 2 is the second half of the season 2 premiere. In the club, a man attending the meeting–who is not one of the gang members–has used some of the drugs to draw a voodoo symbol on the floor. Listening to the recording of the attack, Tandy and Ty are unable to identify the killer. The two call Brigid, who tells Ty that this is his fault and sends the kids away while she deals with the mess. When Mikayla returns to the support group, she tells them of how after seeing her boyfriend scared after his home was vandalized that she has decided that he needs her and that she is moving back in with him. Tandy lashes out at Mikayla, causing her to walk out on the group and likely back to Jeremy. Tandy follows up to check on Mikayla, but no one has seen her. Not Jeremy. Not the friend she was staying with. The group’s outreach director, Andre, says that Mikayla might have gone to one of the group’s safe houses. Out on the street, Tandy takes notice of the number of girls who have gone missing recently from that neighborhood. Because they’re not white girls, the cops aren’t doing much to look for them and the media isn’t covering them. Tandy gets a call that Mikayla was found overdosed on heroin and is in the hospital. Tandy uses her powers to see inside of Mikayla’s mind. Tandy sees out of the back of the ambulance where Mikayla was taken. Looking into the ambulance from outside, she sees that Mikayla was bound and drugged against her will. Tandy goes to the scrapyard where the ambulances are parked. There, she meets the new and improved Brigid and the two apprehend the driver who kidnapped Mikayla. Brigid tells Tandy to keep a look out, and as soon as Tandy walks away, Brigid kills the kidnapper. Ty goes to Evita’s aunt, the voodoo priestess, for information regarding the symbol he saw. She explains that it is a veve and that the man who drew it was either praying for guidance from this life to the next or for justice. Evita walks in and rages at Ty for not reaching out to her and telling her that he is alive and okay in the past eight months. Ty tells her that it is still dangerous for him. Ty demonstrates his power for Evita, who is even more upset that he didn’t just teleport over and talk to her. Ty takes Auntie’s advice and uses a veve to clear his mind and pray for justice. When he does, he is teleported into the back of an ambulance. Mikayla is strapped to a gurney. She says that the drivers kidnapped and drugged her. Ty tries to free Mikayla but is noticed and has to get away before the passenger shoots him. Ty tries again to use the veve, but can’t manage it. Evita visits him and helps Ty not only draw the veve, but helps him focus so that he can teleport others with him. 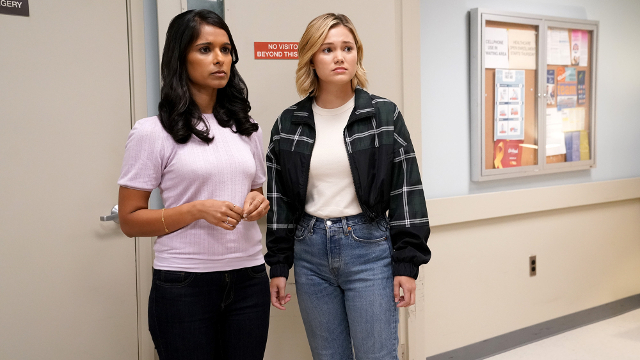 Focusing on Mikayla, Ty and Evita teleport to the hospital where Mikayla is unconscious. Evita helps Ty avoid the police in the hospital, but tells him he needs to get out of there. Ty goes to Brigid’s apartment and hears a scuffle inside. Ty teleports in and finds Brigid bound and gagged. Brigid tells Ty that “she” is coming for them and that Tandy, Ty, and Brigid are all in danger. Ty teleports Brigid and himself to Tandy, who is confused how Brigid could be with Ty. The three enter the salvage yard to discover that there are two Brigids. 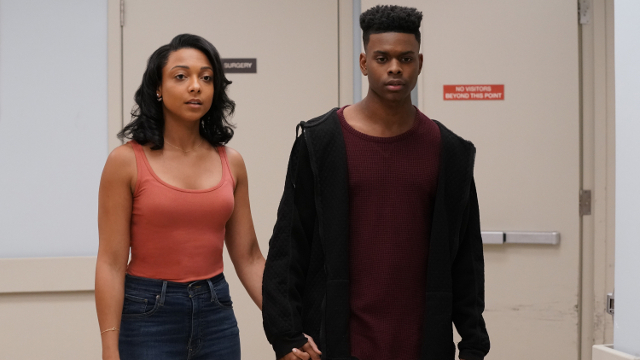 What did you think of the second half of Cloak & Dagger‘s season 2 premiere? Let us know in the comments below.